Objectives: To explore the prevalence rates of lifestyle practices linked to fertility disorders. 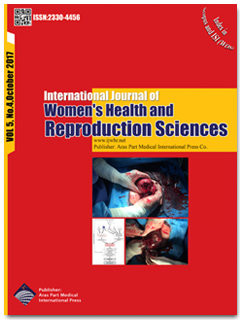 Materials and Methods: A cross-sectional descriptive study, using a validated questionnaire, was conducted among sub-fertile couples attending the fertility center at Jordan University of Science and Technology between February 2013 and August 2014. Results: A total of 126 couples took part in the study. The average length of sub-fertility was 4.2 years. The mean age of the women was 31 years, of whom 70% were <35 years of age. Over 6% engaged in regular sporting activity. Less than 1% of women smoked more than 5 cigarettes per day. For male partners, the mean age was 36 years, of whom 85.7% were <45 years of age. Over 22% engaged in regular sporting activity. None were taking anabolic steroids on a regular basis. Almost 39% of men smoked more than 5 cigarettes per day. The percentage of patients that took advantage of the woman’s “fertile days” on 6 occasions over the preceding 6 months was 29.37%. Low stress was encountered in 24.21%, intermediate stress in 40.08%, and high stress in 34.52% of couples. The most frequent cause of stress was delay in achieving pregnancy. Almost 4% of women displayed 2 or more risk factors, compared to 11.1% in their male counterparts. Conclusion: Behavior-related fertility disorders are common in Jordan. Modifying lifestyle factors for better reproductive health is highly recommended.